The EVOMS V-Flow filter sock "Pre Filter" adds an extra layer of protection against dust and the elements. It installs over our V-Flow filter and will trap fine particulates before they reach the air filter. By adding the "pre filter" sock, filter cleaning service intervals are extended and ease of filter cleaning is increased. Replacement Synthamax* air filter for the EVOMS V-Flow intake systems. Our fully synthetic air filter technology provides optimized flow with unmatched filtering properties which equals maximum power and protection. 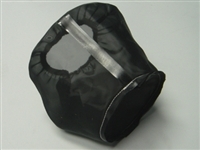 The SynthaMax filter media consists of an inner and outer layer of wire mesh for durable support of filtration media as well as overall filter durability. This filter construction will not deform or collapse under high air flow. The inner filter media consists of two distinct layers of specifically designed synthetic materials that have separate performance characteristics designed to work together for a combined function of outstanding air flow (low restriction) and exceptionally high filtration. Contaminants are first captured by the outer layer of synthetic needlefelt polyester material designed for wet and dry filtration with high air flow capacity. The inner layer of (wet-laid / chemical bonded) (rayon / polyester) captures any remaining contaminants while maintaining high air flow and low restriction. Each separate layer of these high tech materials are design to work together for the highest level of air flow performance and filtration with exceptional durability. • Innovative: Patented Wavetrac® design automatically improves grip in low traction conditions. This feature is truly innovative and unlike any other torque biasing diff design. • Superior Materials: 9310 steel gears run in case-hardened billet or forged steel bodies. ARP® fasteners used throughout. • Maintenance Free: As supplied new, the Wavetrac® differential will perform a lifetime of service without maintenance or rebuilds. • Customizable: If desired, you can alter the diff’s behavior to suit your needs using optional components. • Limited LIFETIME Warranty: All Wavetrac® differentials include a transferable, Limited Lifetime Warranty.